Every day, thousands of men, women and children go to bed with empty stomachs. Jesus taught the importance of reaching out to those that are less fortunate by offering food, clothing and shelter for their needs. The Great Plains Conference works in four mains ways to target this call on a local, interdenominational and global level. Every year, the United Methodist Men gather and donate potato es to the Society of St. Andrew's yearly 'Potato Drop.' This organization, which is a Christian ministry dedicated to gleaning America’s fields and feeding America’s hungry, redirects thousands of commercially-rejected potatoes to soup kitchens, reservations, food pantries, low-income housing areas, local churches and hunger agencies throughout the United States for distribution to the poor. Click here to learn more about this effort. In 2014 NUMB (Nebraska United Methodist Bike) Ride for Hunger celebrated 19 years of feeding the hungry of the world. NUMB has contributed over $715,000 to reduce hunger since the first ride in 1996 to a variety Hunger Projects. NUMB is sponsored by the Great Plains United Methodist Risk Taking Mission and Justice Team. NUMB is a three-day ride that features a circle route with daily mileage around 65 miles. In 2010, all 93 Nebraska counties had been included in a ride and donations approached a half million dollars. View a video, story and photo gallery from the 2017 NUMB Bike Ride. For more information and registration, visit www.numbride.org. You can also follow NUMB on Facebook. Each year on the third Saturday of November, United Methodists across the conference gather at the Douglas County Fairgrounds in Lawrence bringing cash and goods to meet the needs of the hungry in the bounds of the Conference and around the world. Of the money raised 40 percent supports ongoing missions of the Conference in Haiti, another 40 percent to ongoing missions of the Conference in Mexico, and 20 percent is retained for distribution to helping agencies within the bounds of the annual conference. 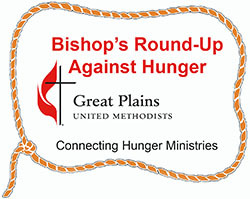 In 2017, the Bishop's Round-up Against Hunger will be Saturday, Nov. 18, at the Douglas County Fairgrounds in Lawrence, Kansas. Download the general report form. View the flier and brochure to learn more. You can follow the Round-up on Facebook. The Bishop's R ound Up for Hunger supports a mission called, "Give Ye Them to Eat." GYTTE was founded in 1977 as a social outreach project of the Methodist Church of Mexico to combat hunger and poverty in the rural sector. The purpose of the "Give Ye Them to Eat" program (GYTTE) is to strengthen the capabilities of marginalized people and communities to meet their basic needs, and to determine and sustain a just and integrated development process. Visit their website to learn more. View the latest newsletter. United Methodists offer hunger relief through the United Methodist Committee on Relief as well. UMCOR partners with other charitable organizations providing relief to children living in poverty around the globe, including in Iraq. UMCOR also has produced a new brochure, "Ten Facts About World Hunger and Poverty," to heighten awareness about those global concerns. Download the brochure.